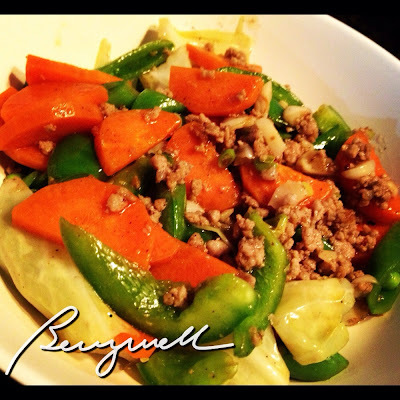 Cooking cabbage and carrots is like a Chopsuey recipe. It's a stir-fry dish, Chinese-inspired, perhaps; and it's very easy to do. This cabbage and carrots recipe is borne from necessity. At least this one is. See, I'm usually cooking for two. I would use only a portion of every ingredients I need, e.g. 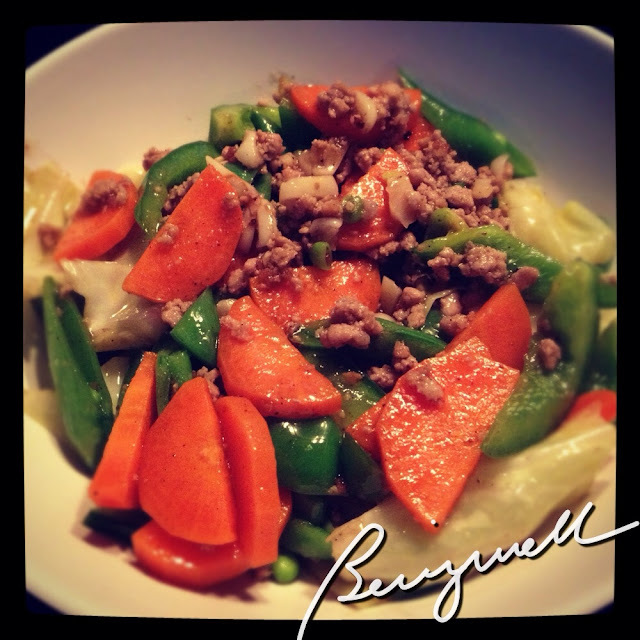 carrots, bell pepper, cabbages, to prepare one full dish. If you visit my fridge, you'll see a number of bits and pieces of cut vegetables which I store and re-store until they are all finally used up. This time, I badly need to finish my last portion of carrots and cabbages. And so, cooking cabbage and carrots recipe evolves. Here's how to make this dish. Let's start cooking cabbages and carrots, stir-fry! 2. Saute' a portion of the garlic. Stir well until golden. 3. Add the ground pork. 4. When cooked, remove the pork from pan. 5. Season the pork with fish sauce and pepper. Set aside for later. 6. Using the same pan, saute' the rest of the garlic. 7. Under high heat, add in the carrots. 8. Add the beans. Stir well. 9. Add the cabbages. Stir well. 10. Add the flavored pork. 11. Lower the heat to medium. 12. Add some water to allow the flavors to mix well together. 13. Season the dish with oyster sauce and pepper. 14. Add in the bell pepper. Mix well. 15. When cooked, remove the dish from pan or place the pan on a cool surface with the dish on. No need to cover the pan at this point, else the vegetables may be over-cooked. 16. Serve with hot rice. Cooking cabbages and carrots is a quick meal that kids at adults would like. It's a dish rich in beta-carotene, fiber and proteins. You'd have to love this. I can relate to portioning vegetables so as to cook for two or three, and have no leftovers. I even have cut small onions into two because it would be too much if I use the whole onion. This is a very healthy meal. I should be having a lot of meals like this. Quick and easy. Best for a busy bee mum like moi. Your recipes never fails to amaze me. keep it up. Really super quick and easy to follow recipe :) You are right this one is rich in vitamins and minerals. I love veggie dishes especially ones that have cabbages in them. I just hope I can cook as well. Hmmnnn...this can be part of my self-imposed cooking experiments. this reminds me of dinner. very easy to cook and looks delicious as well. I'm not really into vegetables but you menu looks and seems to be tasty after all.